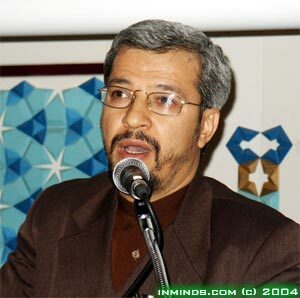 Saied Reza Ameli was a student in the United States, studying Mechanical Engineering when the events of the Islamic Revolution happened. He left his studies and rushed home to join the Revolution. There he took up Islamic Studies, studying at the Howzeh Elmiyyeh in Qum for twelve years. Simultaneously he also obtained a BA in Sociology at the University of Tehran. And since has obtained a MA and Ph.D. in the UK in the field of Sociology of Culture and Mass Media with regards to Globalisation and Muslim Identity. In the UK he helped establish the Islamic Centre of England and later founded the Institute of Islamic Studies. Q1: You have recently completed your research on Muslims in the UK with regards to Globalisation and Identity. Can you please tell us about your findings? Q2: What do you mean by "traditional society"? Q3: You mentioned having discovered eight different identities among Muslims in the UK(*). Can you please explain what you mean by "identity" in this context? (*) Details of these types are given in a previous lecture. Q4: As a community of Muslims living in the west, what would you say are our strengths and our weaknesses, and more importantly how do we overcome these weaknesses? "We don't have community, the community is based on leadership - which we don't have in the west. This is the first important element of a community. Society is based on diversity and when diversity is there, then it should come to unity somehow. The only thing that can bring diversity to unity is leadership, this is something we are seriously lacking in our society in Britain." Q5: We see lots of Muslim communities in Britain: Pakistanis, Iranians, Arabs, etc. Can you please explain what you mean by "community" when you say that we do not have a Muslim community?
" More than 40% of young Muslims in Britain choose non-Muslims as their best friend. When I asked them what is your criteria for choosing a best friend? Or you don't consider religion as a criteria? More than 50% said that 'we do not consider religion as a value for choosing a friend'. If members of a community cannot consume the culture of the community then that community will be weak, and the other culture that is consumed is then strengthened. This a very serious consideration for the future of the Muslim community in Britain"
Q6: What is the future of Muslims in the west? What do you predict? and I think this is the time, and you can see that so far we have 50 million Muslims in the West - this a very important community. I think if there is any chance for the future that we can again have a global Islam all over the world then it is at the time of Globalisation. "